With the spring semester beginning today, NIU unveiled a new crown jewel on campus - the renovated and super-high-tech Fay-Cooper Cole Hall. • The Cole Hall Collaboratory Classroom, which boasts 48 computer stations divided among six separate learning pods. Each pod is equipped with a 65-inch, high-definition digital touch screen, enabling students to interact with educational material in the same way users interact with touch-screen iPads. NIU officials say it is not only one of the most unique and cutting-edge educational settings on campus, but anywhere. • The Anthropology Museum, which offers premium museum exhibition space and a training ground for students. Features include movable walls for creation of customized exhibit spaces, low-iron glass displays for clearer viewing and an eye-catching 10½ -foot-long glass display case cut into the museum’s exterior wall. • The 351-seat Jameson Auditorium. 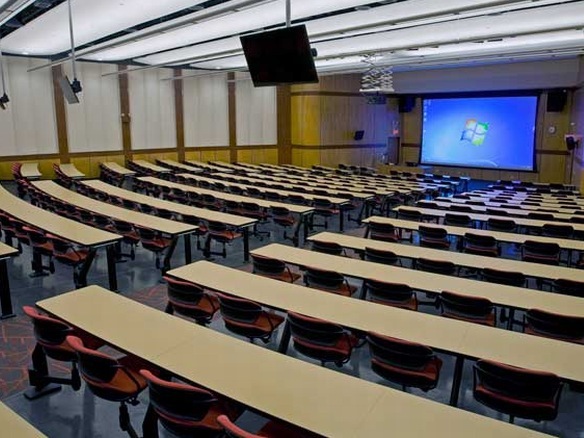 The 43-year-old lecture hall has been completely overhauled with the addition of improved sightlines and access, technology supporting up to 750 wireless devices, comfortable seats that swivel 360 degrees to allow for small-group interactions, the highest-quality HD projection system on campus, back-of-the-room HDTV monitors and a full complement of smart technology to meet the needs of students and educators. Read the article at NIU Today.